A Three Data Reward SIM is a free SIM card on Three which comes with 200MB of free data each month. You don't need to top-up to get your free data and you can use your data abroad at no extra cost in 71 worldwide destinations. How to get 200MB free data every month? Follow the 3 simple steps to get your free data every month forever. 2. Wait for your SIM to arrive in the post. It normally takes 3 working days. 3. 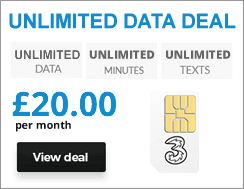 Register your SIM at three.co.uk/freedata and enjoy 200MB free every month forever. Do I need to top-up to get 200MB free data? No. Simply register your data reward SIM when it arrives and you will get 200MB free every month. What can I do with 200MB of free data? Can I use my free data abroad with Go Roam? Yes, can use it in Go Roam locations, allowing you to get online for free abroad in 71 destinations. That's the full selection, meaning you can roam at no extra cost both in and out of Europe, including popular destinations such as France, Spain, USA and Australia. What devices can I use the Three Data Reward SIM in? The Three Data Reward SIM is a data SIM card, which means it’s designed for tablets, dongles and MiFi devices rather than smartphones. You don't need to worry about which type of SIM your device needs because you'll receive a Trio SIM. That's a Standard, Micro and Nano combined, so simply pop out the correct SIM and put it in your device. What happens when I run out of data? When you run out of free data you can still pay to use more data at a rate of 1p per megabyte or choose an add-on. You can top up at any time by voucher, through your My3 account or by calling the network. Three will send you a notification by SMS when you’ve used up 90 per cent of your data and when you’ve used it all up or have no credit left on your account. You can also use your My3 account to check how much data you have left. Your 200MB of data will last 30 days before expiring and being replaced with a new 200MB allowance. If you have another data allowance in addition to this your free data will be used first. There’s a limit of five Data Reward SIM cards per household and Three reserves the right to withdraw or amend the free data offer at any time. It usually takes around three working days to receive your Data Reward SIM by post. You can still use the Data Reward SIM even if you don't have 4G in your area, as long as you've got at least 3G coverage from Three.